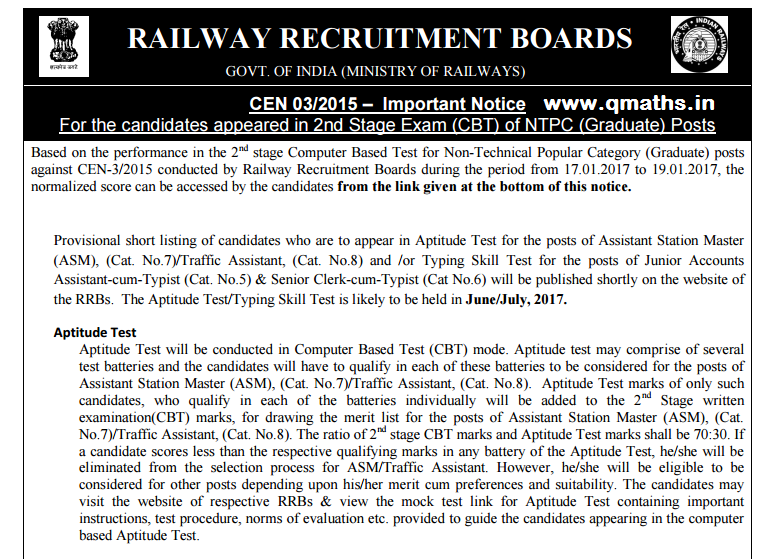 Today (25-05-2017) RRB Issued an Notice Releasing link to view RRB NTPC Mains Score with some Important Notice For the candidates appeared in 2nd Stage Exam (CBT) of NTPC (Graduate) Posts. following is the Highlights of said Notice and you may download this Notice in PDF from the link provided below. Marks of only such candidates, who qualify in each of the batteries individually will be added to the 2nd Stage written examination(CBT) marks, for drawing the merit list . Typing Test will be in the language opted for Typing Skill Test during on-line application stage. Candidates needs to type a passage of 300 words at the minimum speed of 30 w.p.m. in English or 250 words at 25 w.p.m. in Hindi on computer within 10 minutes to qualify in the test. Click Here to Check/View your RRB NTPC MAINS Marks and Fill Marks Survey.